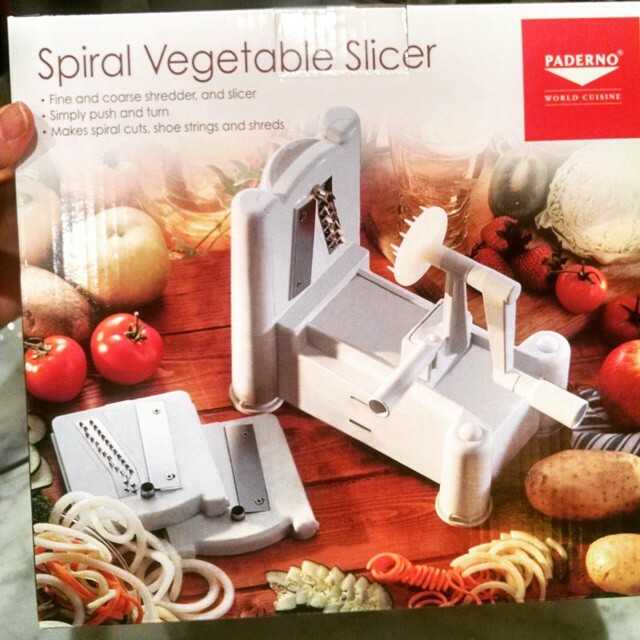 I opened up my spiralizer today and now I just can’t put it down. 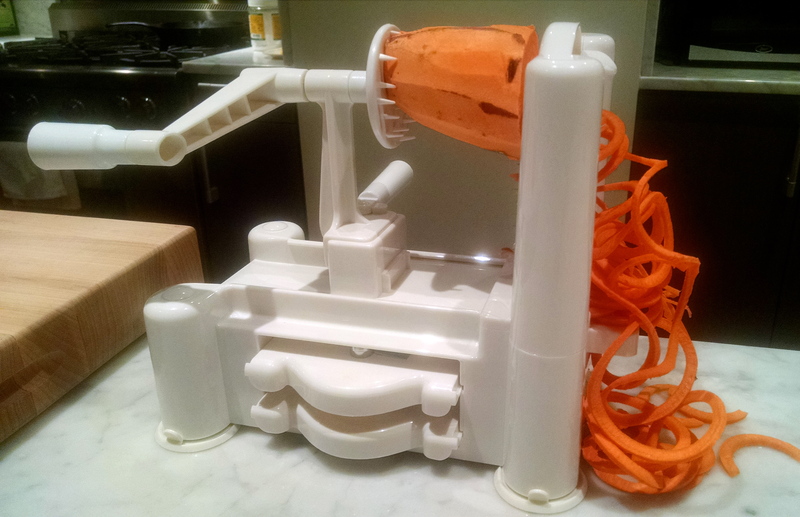 Who knew that spinning veggies through a grater could be so much fun? This evening I just wanted a quick bite and couldn’t be bothered to go out shopping. Actually, I wasn’t even hungry, but I wanted to churn something on that zoodler! So I did the whole kitchen raid thing and went with the Five Ingredient Fix mentality à la Michael Symon on The Chew. 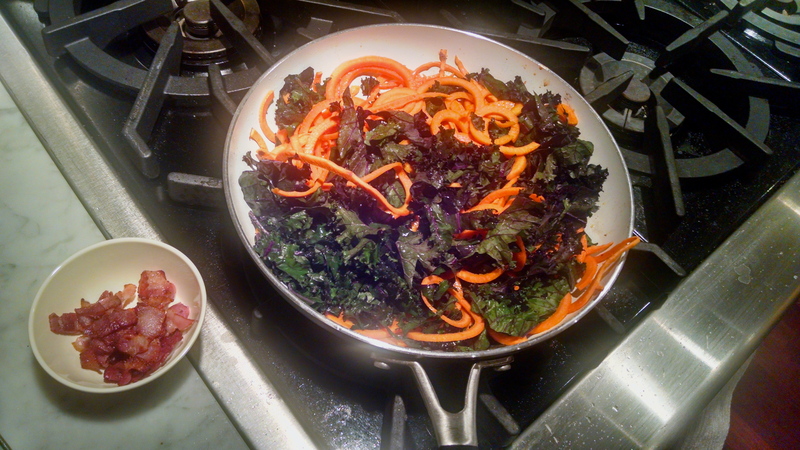 I sorted through the fridge and pulled out the kale and bacon (because those ingredients obviously go together) a jalapeno, half a lemon, and a sweet potato from the counter. I wrote this recipe while channeling Rocky Balboa, so please read with the appropriate accent. 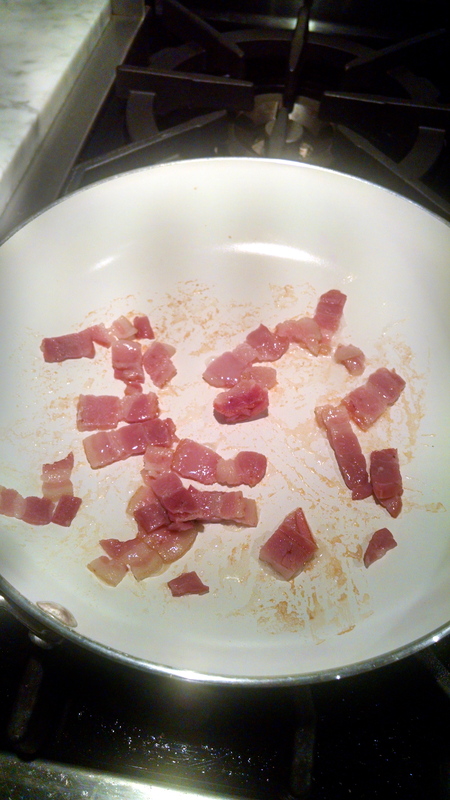 Toss the bacon slices into a ceramic pan over medium-low heat to rendah. 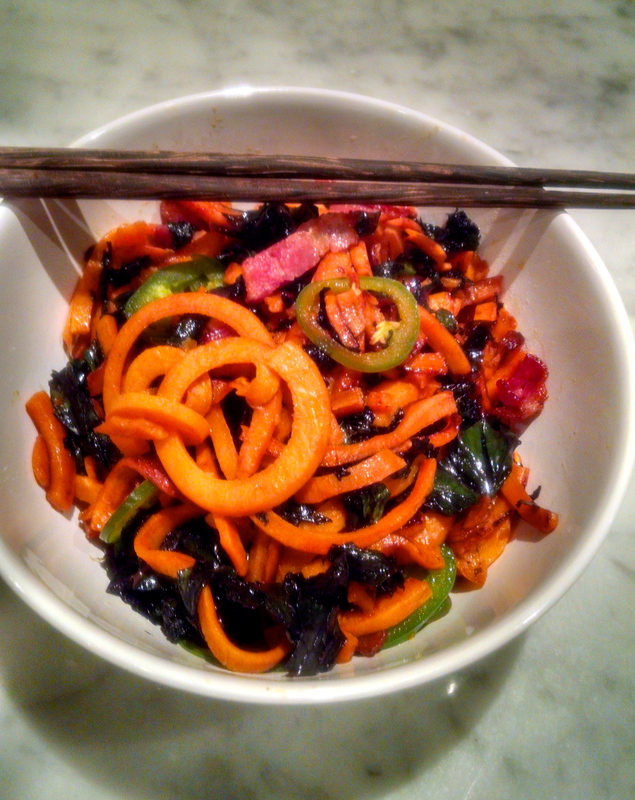 Zoodle the skinned sweet potato on the large noodle grater and mahvel at the beautiful spirals. 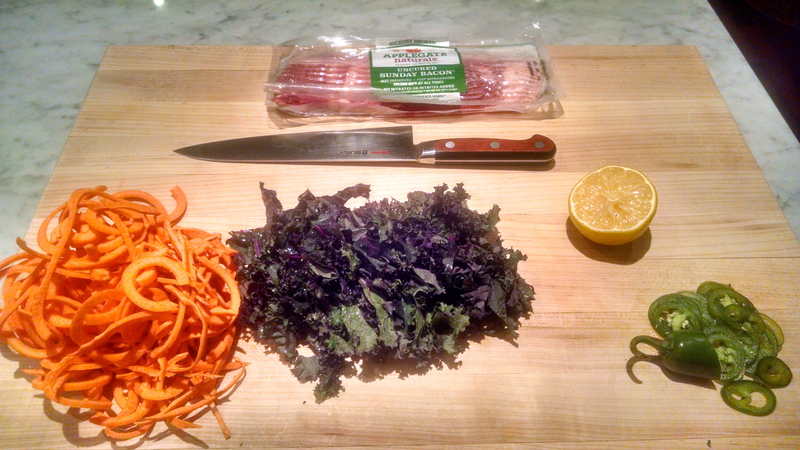 By the time the ‘noodles’ are sliced and the veggies chopped, the bacon just needs a little pushin’ around. I called it some names and shoved it around the pan like the big bully I am in the kitchen. Once it was nice and crisp, I removed it from the pan and set it aside, shaking my spoon and murmuring that I’d deal with that fatty later. I added a teaspoon of coconut oil to the pan and cranked the heat to medium-high. I added the sweet potatoes and kale and gave the veggies a run for their money. I added a scant tablespoon of Red Boat fish sauce to the pan and tossed it all around. The veggies took about 4-5 minutes to cook. I tested the noodle as I would a real spaghetti noodle. I plucked a sweet potato noodle out and bit it with my front teeth to make sure it was tenduh. The seasoning was right, it just needed a bit of a kick. I took the veggies off the heat, added the bacon back in, added the jalapeno and squeezed in half the lemon. I gave the veggies a quick 1-2 and knocked it into a bowl.